This post is all about vegan cheese. Cheese is probably the most difficult to replace of any of the animal products we eat every day so finding good substitutes is very important. Brent and I have been fortunate to try a big variety of vegan cheeses and we’re about to weigh in on what we’ve tried. Daiya This company makes shreds in three flavors as well as 5 pound blocks. Pepperjack, mozzarella and cheddar shreds are perfect for pizzas, quesadillas, or cheesy potatoes/rice/pasta/etc. Shreds is really the genius of this particular product, making it incredibly user friendly. The texture of the shreds is reminiscent of store bought shredded cheese, the mid-priced kind. The block has an airy texture, also reminiscent of the cheap stuff and a flavor that is distinctly cheesy whether it’s cheddar, mozzarella or pepperjack. This is a great cheese for anything where you’d want melted cheese on top. 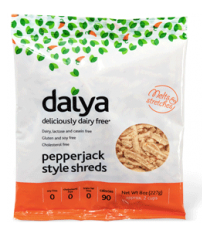 As much as I love Daiya, I don’t like that it’s both high in calories and highly processed. In sufficient quantities, it also disrupts the digestive bliss I’ve achieved through being vegan and gluten-free and I suspect I’m not alone. That being said, I still use it frequently and have a few bags frozen at all times. It stores well when frozen. Their brand is very recognizable and only makes vegan products, I do like knowing I can grab something without discovering it’s not vegan when I get home. We’ll be trying their new wedges soon so check back with us. It costs $3-4 in stores or $6 online for an 8 ounce package of shreds. The 5 pound block and 5 pound bag of shreds sells for $45. It’s more than reasonable. Dr. Cow This company makes a variety of macadamia nut and cashew nut cheeses. They’ve got a slightly gritty (to the eye) texture that spreads well at room temperature and slices well when chilled. I like all of the flavors but am a particular fan of the hemp seed and kale flavored varieties. Brent likes the blue green and dulse varieties best. This particular product isn’t cheesy in a traditional sense. It’s not trying to imitate cheese, it’s really a product unto itself, comparable to high priced specialty cheeses. 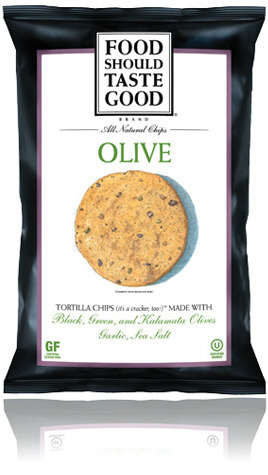 The ingredient list is short and Christie approved: most everything in this cheese is minimally processed (I consider drying or chopping to be a process… call me picky) and gets it’s delicious flavor from high quality simple raw ingredients. It contains nuts but is free of soy or gluten. I would serve this to friends or even strangers as an appetizer with crackers before a fancy meal. We’ve never tried their spreadable cheeses or granola products but we’ll let you know what we think when we do. Dr. Cow retails for $8-10 for a 2.6 ounce package. It’s worth every penny. Eat in the Raw This company makes a range of parmesan substitutes made from nuts, nutritional yeast and other minimally processed raw ingredients. The flavors are great, the nutritional value is commendable and they make several varieties of which we have enjoyed Garlicky Green (shown), Chipotle Cayenne, and original. They’re great over pasta, on vegetables, pizza, popcorn or for whatever else you might use parmesan. It is equivalent to mid priced shaved parmesan. This product contains nuts but is free of gluten and soy. This product typically costs $5-6 for a 3 ounce shaker and $8-9 for 7 ounces. The big shaker is a good value. Follow your Heart We tried the cheddar and mozzarella blocks. The texture was good but the flavor wasn’t quite there. We liked the mozzarella more than the cheddar but that isn’t saying much because mozzarella is Italian butter (according to Brent) and doesn’t have a particularly strong flavor. This cheese melted reasonably well and had fewer calories per ounce than Daiya but was just as highly processed. I would probably buy it again if better options weren’t available but that isn’t saying much. I’m kind of excited to try it on pizza. I’ve paid $4 at the supermarket and $6 online for a 10 ounce package, I think this is a reasonable price if you get it for $4-5. Galaxy We tried their rice cheddar and found it tastes like Kraft singles. I probably wouldn’t buy it if I didn’t have to. It does melt well and makes kid friendly grilled cheese sandwiches. We weren’t drawn in enough by the taste (reminiscent of cheap store-bought) to be enticed try any other varieties. The ingredients were also highly processed… are you detecting a theme? While a lot of the ingredients were organic, they were also refined from their parent grain or legume. Ew. Let us know if we’re mistaken about this product but I didn’t think the flavor, nutrition and high calorie count were worth the texture. 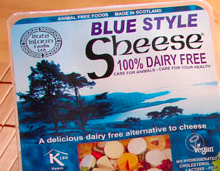 The other issue with their cheeses is that they also sell a variety of casein based cheeses. Casein is milk protein and isn’t vegan. It’s not a problem with their vegan line, per se but it makes me sad. It’s easy to find their non-vegan cheese in standard supermarkets and rarely the vegan and that’s not helpful. I’m not excited enough about it to seek it out. Their vegan parmasan is very good (like cheap store bought parmesan) but we usually buy Eat in the Raw varieties because I like the ingredients better. It usually costs $4 for 6 ounces. Their parmesan is $5 for 4 ounces. They’re overpriced, in my opinion. 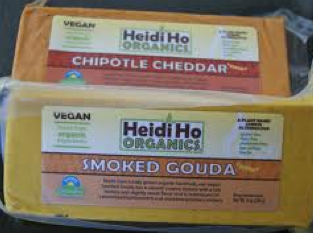 Heidi Ho Organic I’ve only tried the chipotle cheddar variety of this particular brand of cheese. It was definitely chipotle but we couldn’t detect any cheddar flavors in this cheese but definitely an odd garlic flavor, probably most reminiscent of mid-priced cheese. Their product was lower in calories than some and I wasn’t too put off by the ingredients since some of the flavors and textures were still recognizable. Their cheese contains nuts. My big issue (other than the weird taste) was that the texture was also spongy instead of soft or firm like I want cheeses to be in my mind (but not as bad as Ste. Martaen). It melted but not in the traditional sense; it got soft but didn’t lose it’s shape and become stringy. I think it’s fine for cooking but so far other vegan cheeses have won out in that category both in taste and texture. I still want to try their other varieties. You’ll pay $6-8 for an 8 ounce block. I wouldn’t pay more than $4. Sheese We tried the blue cheese, gouda, mild cheddar and smoked cheddar versions of their block cheeses. We liked the texture and the value but found the flavors odd. I really enjoyed the blue cheese, gouda and smoked cheddar flavors but substitute the blue cheese for feta and gouda for goat when I use it in salads. The texture is harder, like wax but not waxy and slices well. The ingredients were highly processed and includes soy but are free of nuts and gluten. It’s pretty good right out of the box but not all flavors are created equally. We never got to cook with it but if and when we do, I’ll let you know. We also tried their garlic and herb creamy sheese. It wasn’t great but that didn’t stop us from eating it; the soy flavor was very strong. Usually you can find their 8 ounce wheels and tubs for $7. Either you like this product or you don’t, whether or not its worth it is up to the individual. Ste. Martaen We tried the muenster, pepperjack, olive, colby, and smoked gouda. They all had great flavor but the texture was very off putting. I ended up using this cheese to cook and was pleased that it was low calorie and melted to something creamy and flavorful but this cheese isn’t suitable for eating right out of the container. The texture was spongy and the liquid flavoring oozed out of it when you start to chew it or even if I just squeezed it between my fingers. The ingredients were not objectionable and include algae (very clever) and nuts but not soy or gluten. I’m worried that it got frozen or something and it negatively affected the texture of this product. I can’t imagine people would rave about it the way they do if that wasn’t the case. I’ll certainly buy it again just for the awesome low fat, lower calorie, cholesterol free mac & cheese we’ve made with it. It’s $7 for a 8 ounce block. 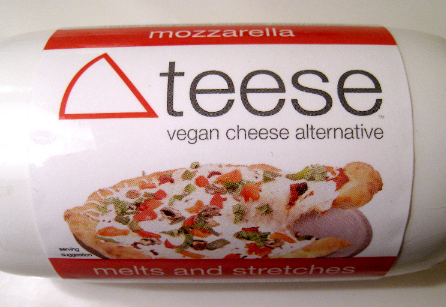 Since I wouldn’t eat it right out of the package, Teese is a better value for sauces and Daiya is better on pizza. Teese We tried their cheddar and mozzarella. I am a huge fan of the mozzarella. The cheddar isn’t my favorite but I do buy it from time to time. 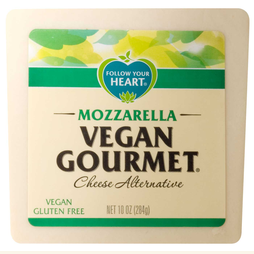 The mozzarella is great on pizzas, in mac & cheese, or right out of the package. Some of the ingredients were highly processed and therefore objectionable but the end product is not. It’s free of nuts and gluten. It’s got a smooth cheesy texture and even though it has a distinct soy aftertaste, it’s a great mozzarella substitute, cold or hot. It makes a great pizza topping or mozzarella and tomato salad. It’s a really versatile cheese substitute. I’m interested in trying their other varieties. I’ve paid $4-5 for 10 ounces. I think it’s a great value. Tofutti Tofutti’s cream cheese is the best we’ve tried so far but we’re always searching for better options. The ingredients are pretty typical and it has a strong soy flavor. It’s got a great texture and is spreadable, very reminiscent of dairy cream cheese. I’m looking forward to trying some of their other products. I haven’t paid more than $4 for an 8 ounce tub. It’s a good price but keep in mind we’re planning to review 2 other brands of vegan cream cheese. The opinion may change. Change is good! That’s it for the cheese post. 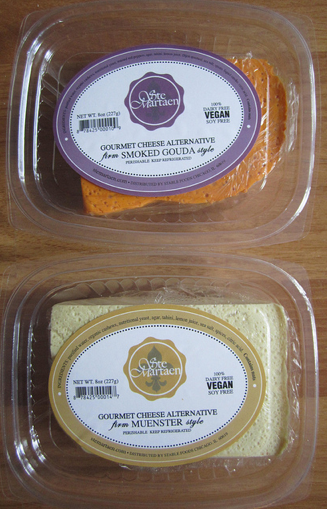 Check back as we test out more vegan cheese alternatives. As you can see, there are a lot of healthy alternatives including several great ones (Diaya, Eat in the Raw, Dr. Cow and Teese being my favorites) and a lot of good ones (Ste. Martaen, Follow Your Heart, and Sheese). Dairy cheese is 5 cents to 3 dollars for an ounce (Velveeta to fancy manchego). You’ll pay 50 cents to 3 dollars per ounce of vegan cheese with the average being closer to fifty cents. Vegan might seem pricey compared to dairy cheese but if you consider the hidden costs and possible costs to your health, it’s a steal. We’ve always got our eye out for more so check back soon! In the near future we’re going to try Daiya’s cheese wedges, Punk Rawk Labs nut cheeses, Vegetarian Express Parma Zaan and Wayfare Foods’ We can’t Say it’s Cheese Spreads. Please make any suggestions for vegan cheeses you’d like to see reviewed here.